Here it is February, and I hope you all are full into the swing of 2018. I’m resolved to get back to regular blogging, health permitting. I’ve missed all of you. One of my goals in 2018 is to become more proficient in Facebook Ads. We’ve acquired a couple of large Facebook advertisers over the past year, and while I’m comfortable managing the accounts, I know there are nuances that I still need to learn. And I’m guessing many of you are in the same boat. A few months ago, the hashtag #FBAdsChat emerged on Twitter. I immediately created a column for it in Tweetdeck. 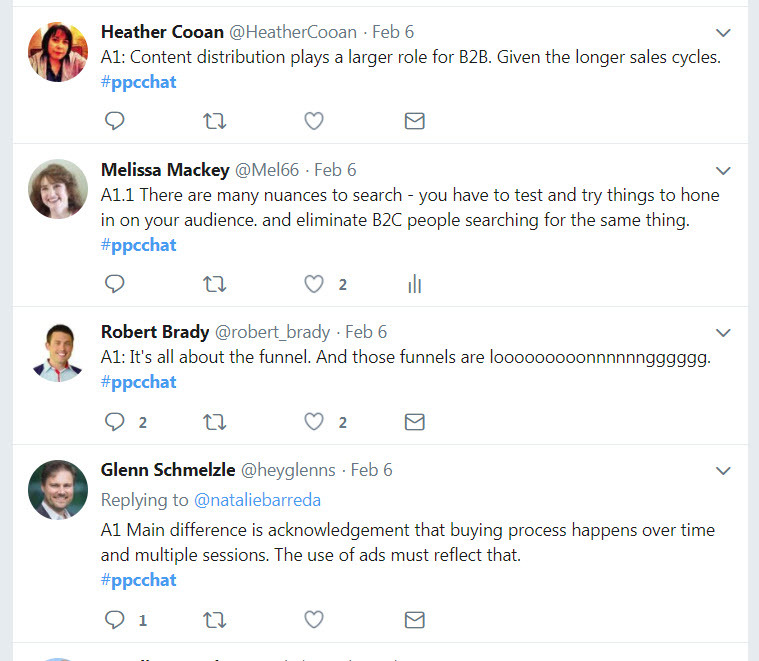 While the tweet volume isn’t as high as on #PPCChat, it’s still worth following. In addition to following #FBAdsChat, here are the top 5 Facebook Ads experts to follow on Twitter. Susan Wenograd – @SusanEDub. Susan started the #FBAdsChat hashtag and hosts the chats that happen periodically on Thursdays at noon Eastern time. Susan has emerged as the premiere expert on Facebook Ads. She’s spoken at just about every search conference out there, sharing epic Facebook Ads knowledge. If you follow just one Facebook Ads expert, Susan is the one. She recently started her own company, too – find her online at susanwenograd.com. Matt Mason – @MattMasonPPC. Matt is Senior Client Manager at PointIt. He’s active on the #FBAdsChat hashtag, asking great questions and sharing knowledge. He often hosts the chat when Susan isn’t available – he’s even done some spontaneous chats just because people want to. He’ll be speaking about Facebook Ads at the upcoming Hero Conf, too! Timothy Jensen – @timothyjjensen. A longtime participant in PPC Chat, Timothy has been actively contributing to #FBAdsChat as well. He’s Campaign Manager at Clix Marketing. If you want nuggets on both PPC and Facebook Ads, give him a follow. Akvile DeFazio – @AkvileDeFazio. Akvile has done everything, from working at Third Door Media to agency work to owning her own social advertising firm, Akvertise. Since she focuses on paid social, she shares lots of great tips on Facebook Ads on Twitter. She’s super nice too – someone great to know. Michelle Morgan – @michellemsem. Michelle is Director of Client Services at Clix, and a frequent poster in #FBAdsChat. She’s always finding new features in the Facebook Ads UI, and isn’t shy about sharing. 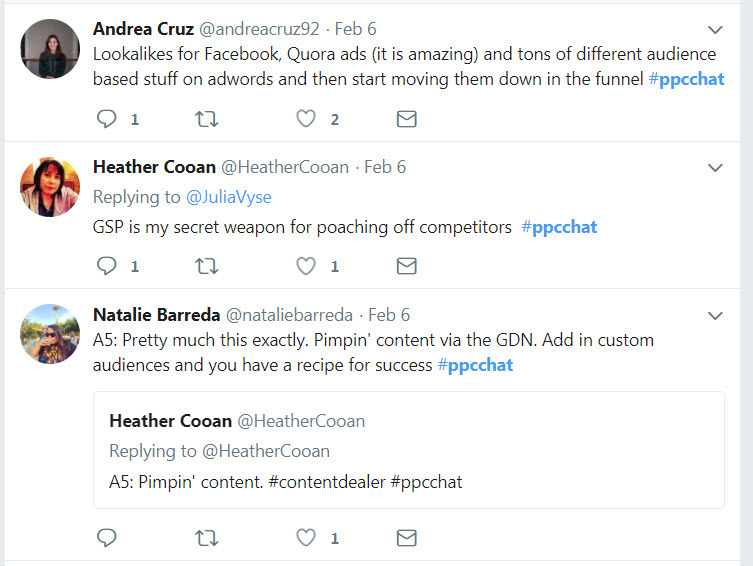 Michelle has been around the PPC Chat scene for a while and still posts there too. Bonus: JD Prater – @jdprater. JD works for AdStage, a social ads management platform. He’s got his finger on the pulse of new Facebook Ads releases, and shares the info freely. AdStage has a great e-newsletter, too – go sign up at www.adstage.io. What about you? Who are your must-follow Facebook Ads experts on Twitter? Share the love in the comments! In previous articles on PPC audiences, I’ve talked about the importance of audiences, who is the audience, and audience segmentation. All are necessary when conceptualizing a PPC campaign that’s using audience targeting. But once you set up the campaign, what type of info really sells your PPC audience? There are many more. It’s fairly easy to brainstorm ideas, figure out which ones make business sense, and test them with your audience. But what about B2B lead generation advertisers? As usual, B2B is tricky. Many advertisers are not selling a physical product, or if they are, it’s high-consideration and not going to be purchased online in an ecommerce fashion. Offers like free shipping and customer rewards don’t make sense. What sells the B2B audience, then? Offering a valuable piece of content is a common tactic for B2B – because it works. An in-depth white paper, ebook, or guide that talks about common customer problems and potential solutions is an effective way to generate leads. Gate the content behind a form, or use data connectors like LinkedIn, Facebook, or Google forms to collect contact info. High-value content is a tried and true way to get leads that ultimately turn into sales. If you’re selling software or SAAS products, free trials are highly effective in converting prospects to leads. Trials let potential customers try your product risk-free for a period of time, usually 14 to 30 days. The premise is that once they get used to using your software, they won’t want to stop, so they’ll buy it. I’ve personally become a customer of more than one product this way. Nowadays, with so many things being automated, a little personal attention from a real human goes a long way. Offering a free consultation, a conversation with a specialist, or even just an appointment with sales can be an effective way to get your foot in the door. We’ve had more than one client see success with using a “contact sales” or “free consult” offer, especially for high-consideration products or complicated services that require an individualized approach. Another simple, yet effective offer is to provide a price quote. B2B products and services often do not conform to a simple one-size-fits-all price. There are nuances, service levels, and add-ons that make it impossible to even put a pricing sheet on the company website. Using a form to give a price quote is a great way to not only get a lead, but to guide the prospect into the sales funnel. If you’re the market leader, or if you have a feature that your competitors lack, using a landing page with a comparison grid is very persuasive. Whether you choose to bid on competitor keywords or not, using a comparison grid helps show how you stack up, and convince a prospect to choose you over someone else. While a grid like this isn’t an offer per se, it’s a gateway to pique a user’s interest and convince them to provide their contact info to learn more. Try it on a landing page with an offer, as an added boost. What about you? What type of info or offers have you tried that really sell your PPC audience? Share in the comments! Creating PPC reports is a big part of every PPC professional’s job. Whether you work in-house or at an agency, it’s almost always necessary to report on campaign performance. When I started doing PPC in 2002, reporting usually involved downloading raw data into Excel and trying to make sense of it. Today, there are countless tools available to help create PPC reports. Some are paid, like Optmyzr, Swydo, and reporting tools within bid management platforms like Acquisio. Others are free – Google Analytics, Google Data Studio, and the reports section of Adwords, to name a few. Most reporting tools include a WYSIWYG editor that helps you easily create graphs and visualizations. If I needed to quickly answer the question “how are my campaigns doing?”, I couldn’t do that with this report. Folks, we can do better. Contrast this image to the previous one. At a glance, I can tell that we are below our target for responses, and that our CTR and budget are below target as well. From that, I can infer that we are below target on responses because we have not spent what we thought we would. As an agency, this isn’t a great thing to report to a client, but it’s immediately clear what is happening and what needs to be done about it. Visuals like this make it easy to focus on insights and recommendations: why are we underspent? What are we going to do to fix the issue? That’s the info that clients are looking for from a report – not a dump of numbers without context. If you’re creating reports consisting of numbers in Excel, it’s time to rethink your reporting. 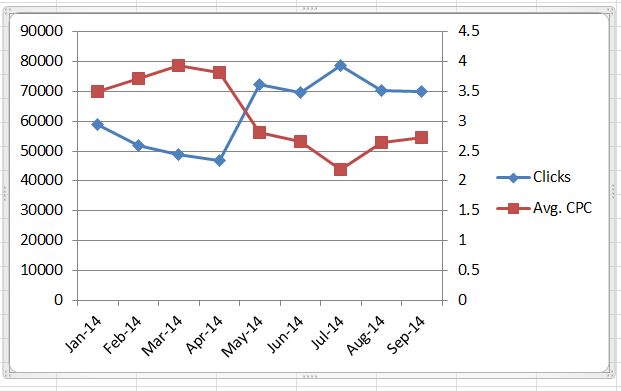 Even adding a simple Excel graph showing KPI performance over time can make a difference in how easy the data is to digest. Resist the urge to throw data into the report just because it exists. Every element of the report should have a purpose and should illustrate how the campaigns performed against goals and objectives. For example, is performance by device really necessary? If you’re not going to do anything different in the campaign as a result of the data, don’t include it. And if your campaigns don’t have clearly defined goals and objectives, stop everything and read this post. Creating good visuals in a report doesn’t require fancy BI tools. The health check in the example above is a simple Excel chart with added circles created in PowerPoint. Mountain graphs aren’t necessary either – you could use two lines and achieve the same objective. The point is, we can do better. PPC reports shouldn’t require a math degree to decipher. Remember, a picture is worth a thousand words. What are your favorite PPC reporting tactics? Share in the comments! What’s In a Good PPC Report? I’ve been writing a lot about PPC audiences this year. PPC audiences have been the talk of marketers for a couple of years now, and with good reason. We used to have keywords, and paid social – and the two didn’t cross paths. Now, we have RLSA, remarketing, in-market audiences for search, and loads of other great ways to combine the intent of keyword search with the targeting of paid social. Here are 5 great articles from around the web on PPC audiences. No, Paid Search Audiences Won’t Replace Keywords by Kirk Williams. A thought-provoking post about why keyword search is still important, even in the face of so many audience targeting options. Why I like it: “Now, before we get into the throes of keyword philosophy, I’d like to reduce the number of angry comments this post receives by acknowledging a crucial point.” It’s vintage Kirk, and still tees up the premise of the article. In-Market Audiences For Google Search Campaigns by Dan Roberts. 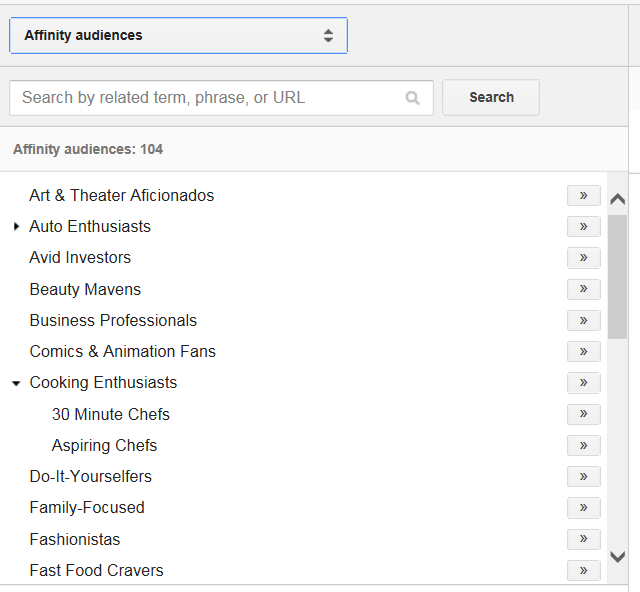 An excellent overview of the recently-launched in-market audiences for Adwords. Why I like it: The post lays out the details on how to use in-market segments for search – and then points out that, while this is a cool feature, it shifts the power from advertisers to Google. Right on. PPC Audience Targeting From Google To Social by Alaina Thompson. A detailed post on branching out into paid social targeting, with a link to another detailed article on search audiences. Why I like it: Alaina talks about why customer match is so powerful. Podcast: Michelle Morgan, Negative Audiences and Audience Shaping, an interview of Michelle by JD Prater. OK, this isn’t technically a post, but podcasts are cool too. Michelle goes in-depth on negative audiences and why they’re so important. Why I like it: It’s a podcast! With Michelle, who I’ve enjoyed watching her career take off over the past few years. Getting Started with Audience Targeting in PPC by me. OK, I wrote this – but you should still read it! This post has a little bit of everything about audience targeting. Why I like it: I wrote it! (Just kidding!) Unlike many how-to posts, this one talks about offers as well as choosing audiences. PPC audience targeting is here to stay. Have you read any great posts about PPC audiences? Share in the comments! When you want to expand your Adwords account, and you’ve exhausted your options in Google Search and remarketing/RLSA, you may want to consider the Google Display Network. The Google Display Network, or GDN for short, can be a great way to generate incremental traffic and sales. Approach the GDN carefully, though. Ads in the GDN are not search. They’re shown based on the relevance of advertisers’ ads to the content on the website. Users viewing the ads are reading content, not actively asking questions. 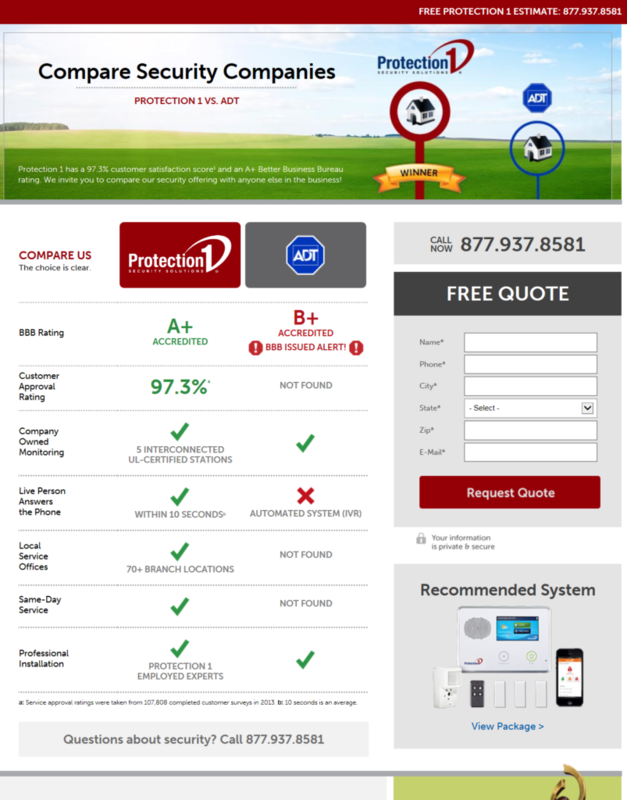 That said, the GDN offers high impression volume and incremental exposure for your business. 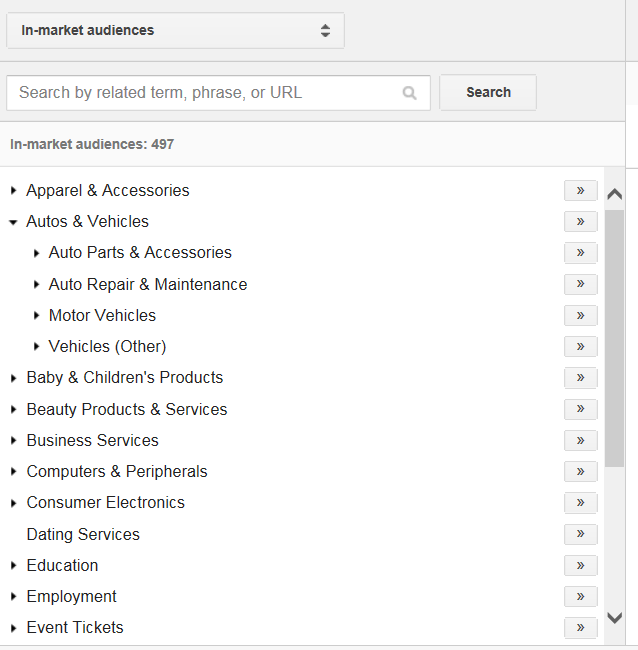 To target your ads on the GDN, you can use keywords, placements, topics, interests and remarketing, or demographics; or any combination of these. This list of terms seems random, but it’s not. Websites with this type of content will be relevant to your target audience. Remember, users aren’t searching on these keywords – they’re used directionally by Google to help match your ads to site content. Remember that high-traffic, well-known placements will have significant competition for ad space. If you choose popular websites for placement targeting, be prepared to bid quite high to be able to generate impressions. Still, for advertisers who know where their target audience hangs out, placement targeting can be an efficient way to target on the GDN. You can select as many topics as you’d like. Make sure they’re relevant, of course. In addition to remarketing, the GDN also offers interest targeting, based on either affinity audiences or in-market segments. If you are an auto dealer, think how valuable it would be to serve ads to people who are actively looking to buy a car! If you took marketing courses in college, you probably studied demographic targeting. Advertisers can target GDN ads by gender, age, and parental status. You can also exclude demographics; for example, an advertiser targeting business owners might exclude users in the 18-24 and 65+ age groups, as these ages are less likely to be business owners. If you find that you’re getting too much untargeted GDN traffic, you can combine multiple targeting methods to narrow down your audience. In the cookware example, you could target by placement, and then add keywords to cover the items you sell: cast-iron skillets, saucepans, utensils, etc. This will help prevent your ads from showing on pages that aren’t relevant to what you sell. Combining keywords and placements works particularly well on large sites that cover a lot of topics, such as CNN and YouTube. 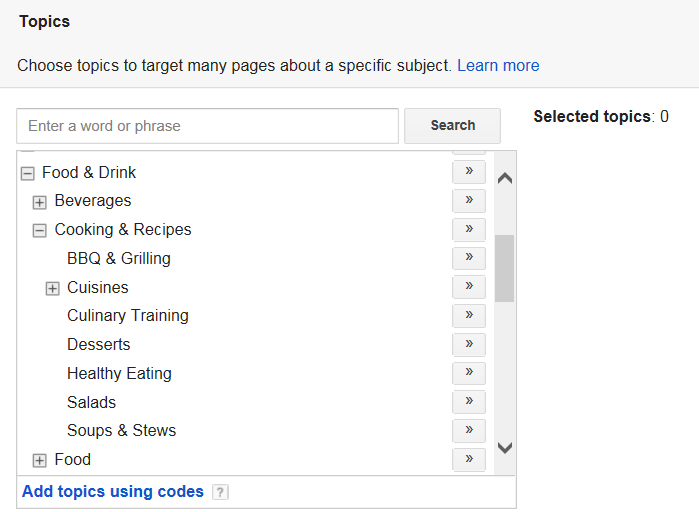 Adding keywords helps your ads to show only on relevant content. Be aware that layering multiple targeting options will greatly reduce the number of impressions you’ll receive in the GDN. Try to strike a balance between quantity (impressions) and quality (targeting). Watch your performance and adjust. The GDN drives much high impression volume and lower click-through rates than those seen in Google search. CPCs are usually lower than search, as well. But it’s important to monitor performance and exclude any targeting options that are not driving converting traffic. While this is true in any search campaign, because ads in the GDN lack the intent of a searched keyword, it’s crucial to keep a close eye on GDN campaigns to avoid wasting money. Many search pros avoid the GDN, but I’ve found it to be a valuable add-on for many clients. When targeted correctly, the GDN is an effective way to expand your Adwords account. How have you used the GDN successfully? Share in the comments! This week’s chat was about data analysis in PPC. We got into what types of data you analyze (anything from time of day to locations to product-by-product results) and whether a PPC manager can handle the data analysis vs. bringing in an analyst. Most people said they spent about 70% of their time doing analysis and 30% new builds. For me, it’s probably 80% analysis and 20% new builds. If you take your time to analyze a problem or situation in a PPC account, the optimizations themselves take little time. Unless you’re constantly adding new products to a PPC account, most of your time should be spent on analysis. People made good suggestions such as stepping away for a while, asking someone else for perspective, and using a preset amount of time to work on PPC data analysis to help focus. As I thought about my answer, I realized I rarely have analysis paralysis. Partly because I’m so busy I don’t have time to! I do remember the days of working in-house and losing hours diving into data, only to realize I couldn’t draw any meaningful conclusions. Interesting data is not always useful data. But I think the bigger reason why I rarely have analysis paralysis is because I’m almost always working on accounts with specific goals and KPIs. 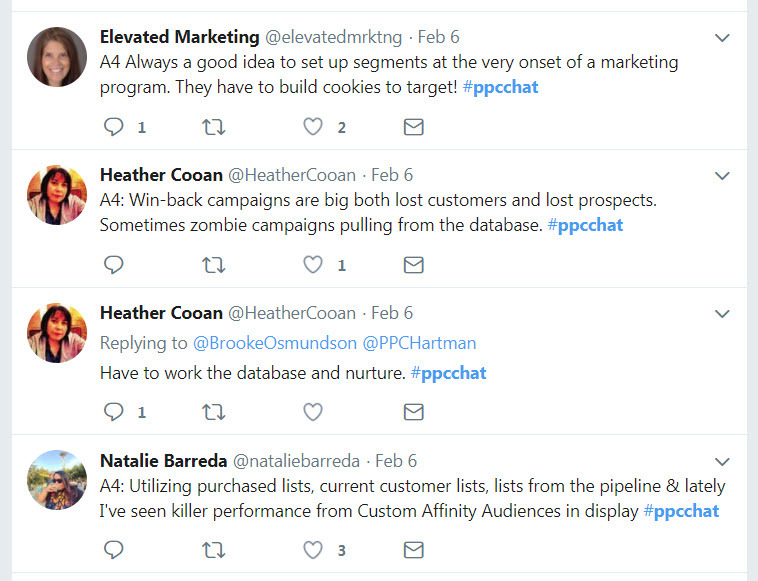 If your campaign goals are clearly defined, your PPC data analysis is easy – you’re digging into whether you met your goal or not, and why or why not. There are nearly endless ways to slice and dice PPC data. That’s what makes it so much fun. But few of us have time to just poke around to see what’s there. In order to be efficient, goals must be defined. Goals are your roadmap – without them, you’re just driving around aimlessly! If your client (or you, as the advertiser) lacks specific PPC goals, that’s ok. You can set goals at any time. Many of our clients come to us with goals in mind, and even specific KPIs if they’ve been doing search for a while. If not, start asking questions. We ask new clients to fill out a brief. 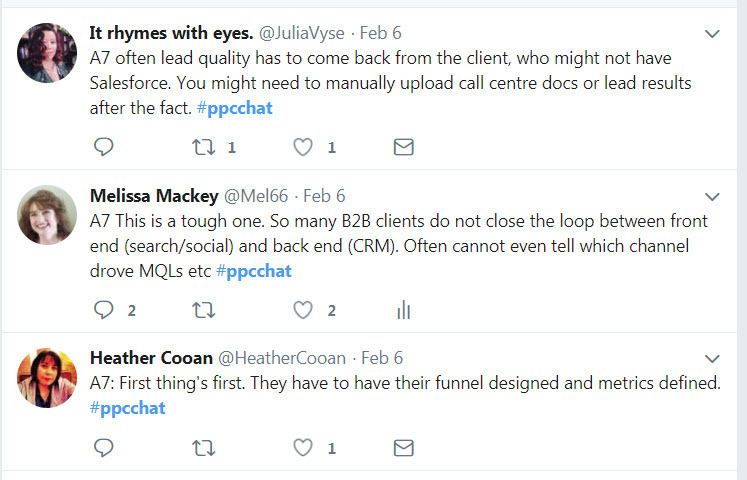 The first question is “What is your business challenge – the problem you’re trying to solve?” This gets them thinking about why they want to use PPC in the first place. Everyone has a reason – you just need to get them to articulate it. We also ask for their primary business goal: what does search need to accomplish? Is it awareness, traffic, lead capture, sales, or something else? The answer drives campaign setup and data analysis. If the primary KPI is lead generation, all data should focus on showing how many leads were generated, how much they cost, which keywords and ads drove the most leads, and so on. Recommendations should focus on how to get more leads: by increasing impression share, improving conversion rates, etc. PPC data analysis is relatively easy if you know what questions you’re trying to answer. Sure, the nitty gritty of pulling data, especially if it’s coming from multiple sources, can be a challenge. But you’ll spend your time gathering data, rather than going down the rabbit hole of endless numbers that may or may not be meaningful. For more on crafting your PPC strategy, check out my Ultimate Cheat Sheet on PPC Strategy. Do you always establish goals with your clients, and do you find it makes PPC data analysis easier? How do you make analysis more efficient? Share in the comments! Seems like every year, I write a post on PPC bid automation and bid management. Manually managing bids used to be practically a full-time job when I started doing PPC in 2002; now, it’s almost an afterthought due to automation. Two years ago, I was asking if PPC bid management was still a thing. Adwords Scripts, automated bid rules, and bid management solutions were my alternatives to manual bid management at that point, and they’re still good suggestions. Last year, I talked about the best times to use automated vs. manual bidding. This year, I find myself wondering if anyone should be using manual bidding at this point. I’m thinking the answer is no. 10 years ago, the only way to use PPC bid automation was through a tool, like Marin, Kenshoo, or Acquisio. Today, with free tools like Adwords Scripts and bid automation rules in both Google and Bing, even smaller advertisers can take advantage of bid automation. Most strategies are available both as individual campaign strategies, and as portfolio strategies across multiple campaigns. Portfolio bidding is a useful strategy that helps advertisers maximize profits across campaigns or sets of keywords. I used a homegrown type of portfolio bidding back in 2005 when I worked in-house; we created a spreadsheet that calculated our profitability on every product we sold, and cranked out the right PPC bids for each product. It was a manual process, but very successful for us. Read more on portfolio bidding in Adwords at Search Engine Land. Not to be outdone, Bing Ads rolled out with PPC bid automation shortly after Google did. The rules are essentially the same as Google’s. If you’re going to use scripts or engine automation, you’ll want to do some homework first. Frederick Vallaeys has a great article on Search Engine Land with an overview of setting up bid management rules. If you’re using scripts, or Frederick’s tool Optmyzr, you’ll need to think about things like lookback windows, ROAS, and target CPA. These metrics are important to understand, even if you’re using a paid tool that does some of the calculations for you. Automating bids in the engines seems easy – and it is. But you’re giving up some control to the engines, which is a little like the fox guarding the hen house. Not all experts are in favor of using PPC bid automation through the engines. 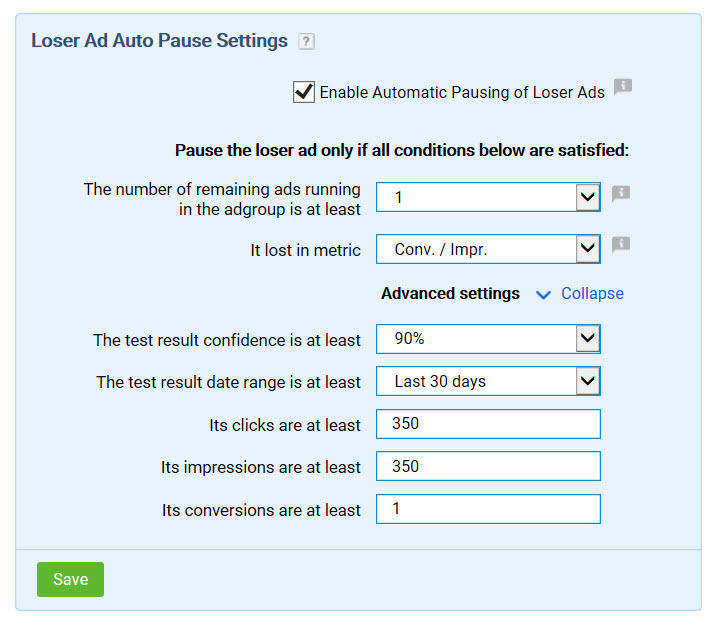 Wordstream has a thought-provoking post on why you should never use Adwords automated bidding. It’s from 2014, but I still tend to agree with most of the article. We’ve often seen automated bidding hurt client performance, either by limiting impressions or click volume, or by inflating click cost to where campaigns become unprofitable. Bid management was implemented in April 2014; immediately the client saw an increase in clicks and a large decrease in CPC. All else equal, this is a win for any client. Prior to implementing the bid management solution, mobile performance was erratic. With bid management, cost per conversion stabilized, and total conversions increased significantly. There are many paid bid management solutions out there – here’s one list, although I don’t agree with their rankings. For instance, they list Marchex, which is a call tracking software, not a bid management solution. Most bid management software providers offer a free trial. I’ve found that the time I save in calculating targets and setting up rules more than pays for the software. Paid PPC bid automation tools aren’t for everyone. With all the great free options out there, there’s really no reason to be manually managing bids these days. Can you think of a situation where manual bid management makes sense or where automation has gone wrong? Or is automation the only way to go? Share in the comments! Bid Management: Is It Even Still A Thing? 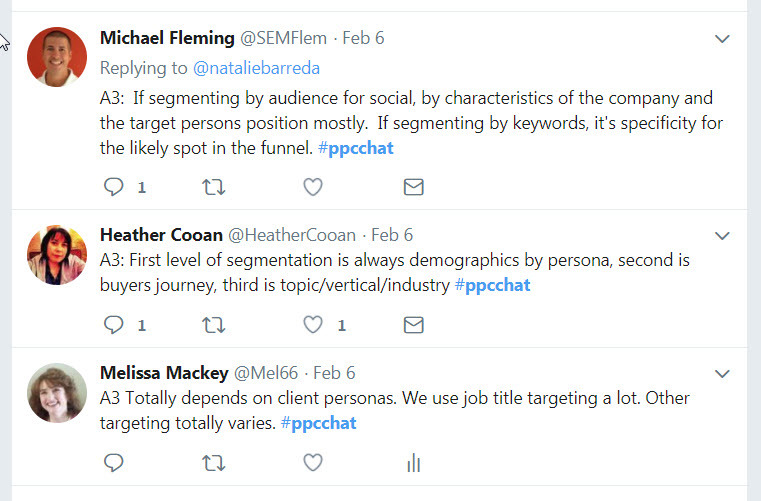 Back in March, I wrote about defining your PPC audience. It’s the first step in setting up audience targeting for PPC, including search, remarketing, or paid social. Once you’ve defined your audience, it’s time to think about audience segmentation. Audience segmentation sounds complicated – and it can be, but it doesn’t have to be. In the simplest instance, for a remarketing campaign, you’ll have two audiences: site visitors, and converted visitors. If you want to remarket to those who haven’t purchased yet, you can set up a remarketing audience of site visitors, and exclude converted visitors. This way, only those who didn’t purchase will see your remarketing ads. But what if you want to get more sophisticated? This is a helpful list of thought starters for thinking about audiences. Think about the various types of offers you could show to someone who hasn’t bought in a year, for example. Maybe they’ve run out of whatever it is they bought, and it’s time to reorder. Or maybe you just want to lure them back with a special deal. For users in a free trial, you can show them an ad with a discounted price for the product they’re trialing. The applications are endless. In B2B, sometimes the use cases for audience segmentation are not so cut and dried. You’re usually not selling anything online, so cart abandoners and purchasers are off the table. It’s not unusual to have a huge audience of people who visited your PPC landing pages, and a very small list of those who filled out a form. What do you do with that audience? If you don’t know anything about them other than the fact that they visited your landing page and didn’t sign up, it’s hard to do much segmenting. Content marketing is a great way to nurture prospects through remarketing. Think of it as a way to talk to those who haven’t raised their hand yet. It’s also a useful way to start segmenting your audience further. The more times they visit your site, the more you’ll learn about them. 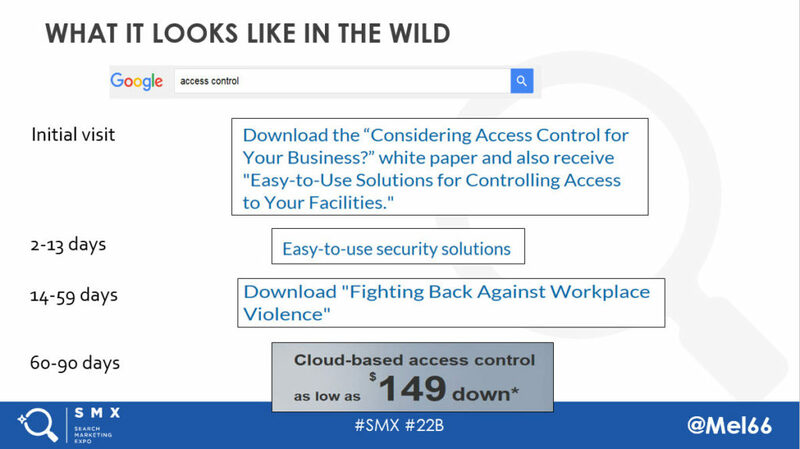 In this example, the offers start out as informational: white papers with information about access control (which is controlling access to your place of business). Then there’s an offer showing how the product is easy to use. Then it gets more urgent with a mention of workplace violence. Finally, for those who still haven’t converted, there’s a price-point offer. Depending on which offers users click through, you can start to segment your audience based on what they responded to. The content and journey will look different for every client. The important thing is to look at your buyer journey to see how long each segment should be targeted. If you don’t know, you can play around with it – test! See how people respond. Get creative with your audience segmentation. Just make sure to plan it out first. Think about which audiences make the most sense. Think about what content or offers you have available, and which make the most sense for each audience. You may uncover some gaps, meaning you’ll need to create content or offers to fit. Don’t be afraid to experiment and test! Think of audience segmentation as another PPC test you’re running – just like ad copy testing. If something isn’t working, just shut it down. Test both remarketing and RLSA. 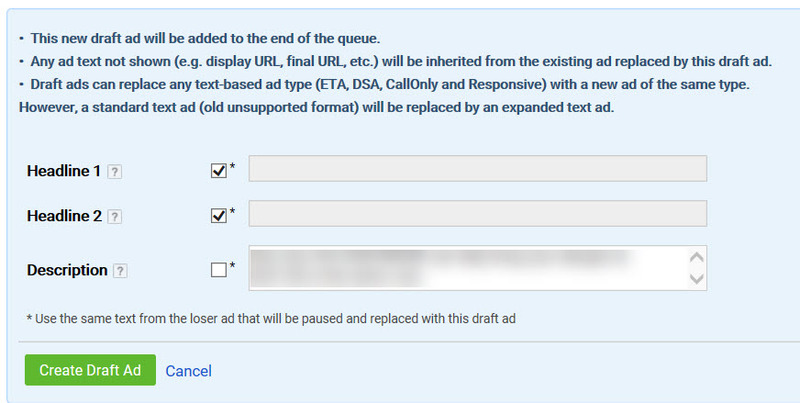 With RLSA, you can run “bid only” tests, where you’re simply adjusting bids for the audience. In many cases, this alone can be profitable, or at least informative – again, helping you to create additional audiences. Play around with it. 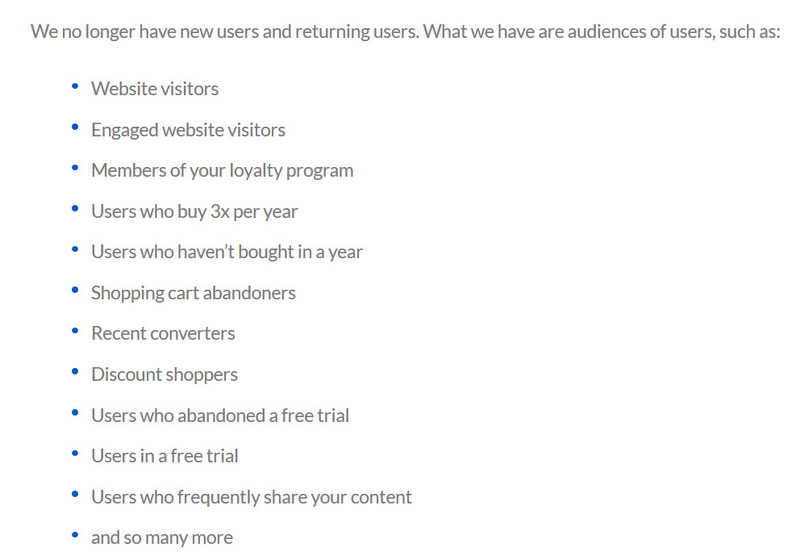 What are your tips for audience segmentation? Any out-of-the-box segments you’ve tried that work well? Share in the comments!